Tag Archive | "Emma Watson"
Celebrities everywhere are ditching their hair and showing off their features with short hair and the most popular cut by far is the pixie haircut. A pixie (or crop) is another fun short hairstyle that has popular since the 1920s when flapper girls started wearing the look. A pixie is the basic bold and fierce short hairstyle. 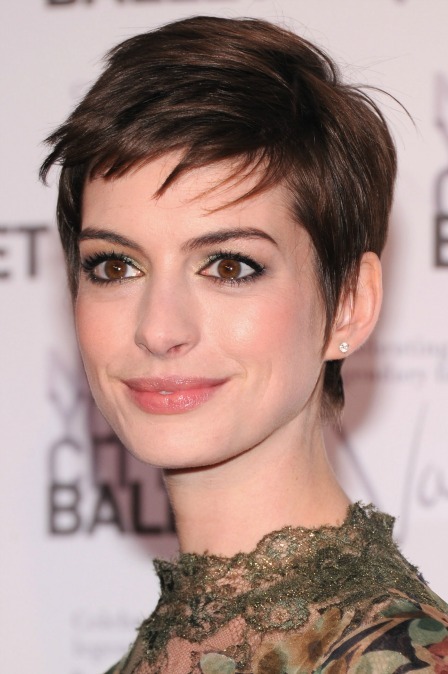 One way to wear the pixie is to have a large side sweep, which is elegant and frames your face beautifully. A more dangerous take on the pixie and side sweep is having the side swept section significantly longer than the underneath section. This is a gorgeous look for those with a more rounded face but still want to rock the shorter look. A pixie can be worn choppy, layered, spiked, with texture, or straight. It truly is the ultimate short hairstyle. Many celebrities like to show that they are fun and eccentric and a pixie hairstyle can give this impression. This cut generally falls between your ears and an inch or two above your shoulders. This cut looks perfect: wavy, straight, shaggy, and curled at the ends when you want to add some extra glamour. You have probably seen celebs like Rihanna and Alexa Chung sporting their bobs.